There are few good sports films that aren’t riddled with clichés and there are even fewer good films about skiing. Downhill Racer (1969) is one of those rare exceptions. Based on Oakley Hill’s 1963 novel, The Downhill Racers, Paramount Pictures optioned it in 1966 for producer Steve Alexander and screenwriter Graham Ferguson. They were unable to get the project off the ground and studio production head Robert Evans used it to get Roman Polanski (an avid skier) to come to Paramount and make Rosemary’s Baby (1968). Polanski toyed with the notion of casting Robert Redford in both projects but the young actor was more interested in Downhill Racer (he too was fond of skiing) and found a director, handpicking Michael Ritchie based on his impressive body of work in television. 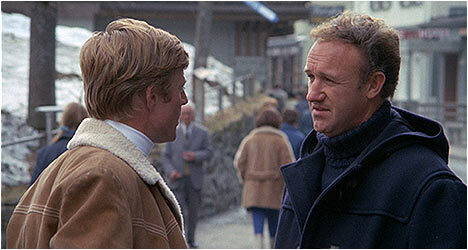 The studio wasn’t too crazy about the project and gave Redford a small budget to work with so he and Ritchie shot it guerrilla-style in Europe. When one of the members of the United States Olympic skiing team breaks both his legs in a competition, David Chappellett (Redford) is flown in to take his place and try out for a spot on the team. Ritchie captures the opening race in a dynamic, you-are-there style that conveys the speed and intensity of hurtling yourself down a steep, snowy hill. He accomplishes this by employing snap zooms, freeze frames, intense close-ups, and point-of-view shots from the skier’s perspective. This kind of camerawork also conveys the danger inherent in this sport. Chappellett is arrogant and immediately resents the team’s coach (Hackman) for placing him so far back in his first race. So, he refuses to ski until he gets a better placement. When Chappellett does race he finishes an impressive fourth place. However, he wipes out on his second race and butts heads with his coach over placement yet again and is told that he just wasn’t good enough. In the off-season, he trains hard and goes home to his boring hometown and disinterested father. It’s no wonder that he wants to get as far away as possible from his humble origins and strive to achieve greatness at the Olympics. Robert Redford is well cast as the driven loner who strives to be the best skier in the world. A youthful Gene Hackman is his ideal foil as the coach who refuses to put up with Chappellett’s prima donna antics. Downhill Racer has the look of a late 1960s – early 1970s film that came out of Hollywood on the heels of the success of Easy Rider (1969), which opened the floodgates to offbeat subject matter, like downhill skiing, to get made. Unfortunately, Paramount didn’t really care much for the film and it quickly disappeared into obscurity for years, making it a prime candidate for rediscovery by the Criterion Collection. This Blu-Ray transfer features a sharper image with greater detail and colors that just pop. This is a definite improvement over Criterion’s previous DVD edition. “Redford and Salter” is an interview with Robert Redford and the film’s screenwriter James Salter. They talk about the genesis of Downhill Racer. Redford wanted to make a trilogy of low-budget films about winning based on his experiences with sports. He chose skiing because he hadn’t seen many films dealing with it. Redford liked that Salter approached the material in an abstract way. They also both wanted to explore the nature of winning. “Coblenz, Harris and Jalbert” features interviews with production manager Walter Coblenz, editor Richard Harris and technical adviser/ski double Joe Jay Jalbert. They discuss their involvement in Downhill Racer. Jalbert point out that many of its dynamics ring true today. The film’s cinema verite style is still popular with skiers of today. All three men tell several engaging filming anecdotes. “Michael Ritchie at the AFI” includes audio excerpts from a 1977 seminar at the American Film Institute. Naturally, he talks about working on Downhill Racer and his career in T.V. He also speaks about getting involved in the project and the studio’s resistance to the film. Also included is the trailer. Finally, there is “How Fast?” a promotional featurette done for the film’s theatrical release. Narrated by Redford, it’s not your usual press kit fluff, opting instead for a fascinating look at the sport of skiing before showing off some really good behind-the-scenes footage.